Easy to Understand Billing: We give you straightforward bills that are easy to understand and you will deal with our trustworthy and expert employees that live up to their promises. You can rely on having fair and honest pricing from a woman-owned company. On-Time and On-Budget Delivery: We will be there when we say we will be there, and we will do your job for the agreed-upon price. The Right Fuel, Always: We will always give you the correct fuel for your equipment. In a world full of choices, you will always have the right one. Your business likely requires any number of different fuel products. Heating oil, off-road or on-road diesel, gasoline, kerosene, motor oil and lubricants – the sheer number of products and volume can be overwhelming. At Von Eiff Oil, however, we provide the products and the equipment-filling you need, all at the most reasonable possible price and with the highest imaginable level of knowledge and expertise. We have been in operation since 1944, so you can rest assured that we are more than equipped to handle your fuel product needs. We are a woman-owned business and a Maryland-certified Minority-Owned Business (MBE). In addition to working with us for our professionalism and expertise – your business can meet the MBE participation goals on the Maryland DOT contracts. 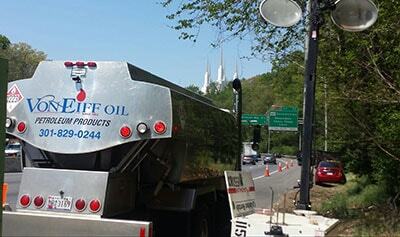 We are a MDOT (Maryland Department of Transportation) certified MBE#09-236 fuel supplier in Maryland. Claim 100% MBE participation with our fleet fueling to your job site (NAICS code 454319). Since 1944, Von Eiff Oil has been supplying businesses and homeowners in Carroll County, Frederick County, Montgomery County, Baltimore County and Howard County with quality fuel products. Contact us or call 1-800-VONEIFF (866-3433) to learn more.